Rockets by name and Rockets by performance. Wow wee! this team did themselves proud yet again this week, coming back from being down 2-6 at half time to winning 12-10. Outrageous effort from the team against the Silverdale shooters following the previous week's win against team Stella 16-8 to the Rockets. Players of the Day this term so far include Kerry, Harper, Eli and this week’s Player of the Day went to George – congratulations George. The whole team are really on fire and should be super proud with what they are achieving on the court with the help of their fantastic coaches who are there to support every game. The competition will breathe a sigh of relief as you have a bye this week. They will need to brace themselves for the return of the Wentworth Rockets the following week! Trainings are at Friday lunchtimes in the College Gym. Please bring your PE kit and shoes. On April 2nd, the Wentworth Asteroids played the Swish. The Swish are a talented team who won their group last year. We were 3 players short and had no choice but to ask another team if we could borrow 2 players. As luck would have it, we got 2 of the best players in the league!! The game started with a bang and it was a thriller of a game! At half time the score was 10-10 and both teams were giving it their all! The Swish pulled out all the stops in the 2nd half and the final score was 12-23 to them. Player of the Day was Brooke Oliver for good rebounding, consistent defence and carrying the ball down the court. The Wentworth Asteroids played the Red Beach Planets on Tuesday, March 19th. It was another tough game and the Asteroids played well as a team and the players did well on defence. Aston shot the goals and Player of the Day was Konstantine Berns for his great defensive effort. At one point he took on 3 players at once and was carrying the ball up the court with far more confidence. The final score was 8-14 to the Planets. WW Asteroids played the Hurricanes on Tuesday 12th March. The Hurricanes were one of the top teams last year so this was a tough game and they beat us convincingly 24-6. In saying that, the team fought hard on defence and were looking to pass the ball to each other. They enjoyed the challenge and took many shots at the basket. Aston shot the points and Ethan Jordan was awarded player of the day for his determination to hang onto the ball, fighting off the opposition and even diving for the ball on the ground! Watch this space as this team is just getting started! The Wentworth Asteroids played their first game against the Smashers on Tuesday. It was a tough game and the Asteroids played well as a team with all players contributing to defence. First time players showed great promise while Aston and Amy were hot on shooting goals. The final score was 16-17 to the Smashers and Player of the Day was Aston Carter who scored 6 buckets and worked tirelessly on defence. The Wentworth Asteroids had a tough game against the Red Beach Solars, going down 2-18. Brooke did a great job of moving the ball down the court while Amy worked hard on defence. Well done to Oscar who scored his first basket this term, and to Amy who was awarded Player of the Day. Wentworth Rockets played the Red Beach Stars on, Tuesday 26th February. With 22 teams in total, this was a grading round. This was the first game of the season and with their awesome coaches from the College and parents cheering them on, the Rockets found their groove in the second half. A stand-out game by Kerry Kong who took out Player of the Day. Congratulations Kerry, you played like a star!! Olliver Lee also made a big impact and Steven Wu chiselled his opponents on defence. A great effort by the whole team to start off the season. It was Nil-4 at half time with Wentworth Rockets still warming up only to come screaming back to tie 4-4. Wentworth Rockets won the league at the end of last year and they are shaping up to pack a punch this term too – Yahoo! Go Wentworth Rockets!! 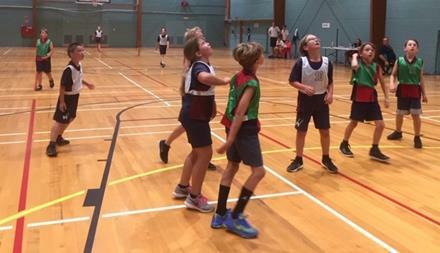 The Rockets played magnificently on Tuesday against Stanmore Bay and also Red Beach. They won both games and have made it into the finals! Ella was named Player of the Day. Well done, Rockets, on a wonderful term of basketball! Yay, we scored a goal – our second since the season started so a big deal for our team! Such a fun game in the pouring rain. We only had 4 players owing to the weather, but they played really well together – such a team, discussing strategy as 5 year olds do as they walked between games, and calling out to each other to pass. In the first game, we lost 4-1 to Kingsway Fire, with our wonderful goal scored by Maddie Vaudrey. We would have scored another one but a giant puddle (small lake!) stopped the ball dead about 5cm off the line – otherwise it would have sailed in. In the second game we lost 0-3 to ‘Fast and The Furious’. In good spirits, the opposition loaned us a player to help balance the sides. Caleb Gainford lost his first tooth on the pitch, so a lot of distractions as children searched for a tooth rather than chasing the ball!! Players of the Day went to the whole team - Caleb Gainford, Ophelia Cooke, Lewis West and Maddie Vaudrey - for playing whilst soaking wet without complaining and for working together. These kids are fearless! Five brave Wentworth Warriors turned up on Monday afternoon last week despite heavy rain and strong winds! Elsa, Ezrah, Charles, Jacob and Theo all deserve to be named Players of the Day as with only five players they all had to be on the pitch constantly as we had no subs. They demonstrated great stamina and enthusiasm, even when playing in tough conditions. Due to the weather our first opponent, Orewa North Stormers, didn't turn up so we were awarded a point by default. 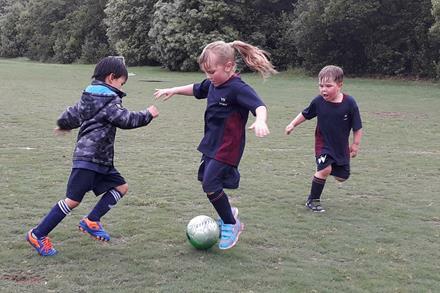 Buzzing with energy, the Warriors went on to play a friendly game with Orewa Primary and won 1-0 after Jacob scored the winning goal. The whole team showed great progress by spreading out, passing effectively and making sure defence was always covered. Our second match was again the Red Beach Barons who benefited from a couple of years of winter soccer training and a number of subs. The score was 5-0 to the Barons. The Warriors continued strongly, not put off and gave their all until the end of the match, demonstrating great resilience and team spirit. Charles was awarded Player of the Day for attending all matches and showing great effort and enthusiasm all Term. Even with the shocking weather we had a full team last Monday; well done everyone. Due to our awesome sportsmanship a couple of our players joined the other team as they were short. We lost both games 3-1 and 5-1 with Ethan scoring both goals for the Magpies. Well done Ethan. Isabella won Player of the Day for her awesome defence and strong delivery as striker. A very wet and wild soccer afternoon. We are very proud of the teamwork and continuous improvement this team is showing. The most important thing is they really enjoy it. If only we could have 5 strikers on the team every week! THANK YOU so much to those who braved the terrible weather last Monday. It was great to see the enthusiasm of the children. These games marked the end of the competition round for us, and it was always going to be a tough ask as we had the top two teams to play. You all played well and never gave up which is always pleasing to watch. A special thank you to Sandra Oliver for her team talks of encouragement, knowing the rules and being their each Monday to support the children. Also a big thank you to the parents who helped to set up the goals each week to ensure we could start our games on time. Thanks also to our parent side line who clapped and cheered us on each week. Player of the Day was Amy Akehurst. In our first game against Silverdale Sting, our team lost 9-0 and in the second game against Orewa United FC, we lost 8-0. Undeterred and cheerful in the face of defeat, our Year 1 team continue to play with enthusiasm and determination. It was a high energy performance. Player of the Day went to Caleb Gainford for consistently good play, some good defending where he saved 2 goals, always organising his team mates, and always chasing the ball. Trainings are run at lunchtimes on Mondays for Years 1 & 2. The Warriors are growing in confidence and it was the girls turn to shine on the pitch at their last game. Selena, Elsa and Chloe put in some great tackles and headed for goal. Jacob and Timofei worked hard to get the ball into space and find their team mates. Ezrah came close to scoring and good team work found Jacob in space. He sent the ball flying into the goal. The side line supporters had some tense moments as the Warriors ran hard to win their first game. Both teams were evenly matched and, fuelled by our afternoon tea (thank you Ezrah’s Dad and Charles' Mum), the Warriors were running end to end with both teams sending goals wide. The referee deserves a special mention – he coached both sides and kept the game fun and friendly. A great set of passes from the back found their way to Jacob who dodged the defender and powered the ball into the back of the net. The Sharks came at the Warriors in the 2nd half with lots of shots on goal. The girls once again showed their tackling skills and Charles and Ezrah ran their legs off covered the pitch. The Sharks scored late into the game. Our amazing 'Sideline Support Crew' voted Selena Woolsey as Player of the Day for her tireless running and fearless tackling. Wentworth Dragons keep on growing as a team. They played really well in what turned out to be a nail-biting game against Stella City. Score was 0-0. Our second game of the day against Stanmore Bay Avengers was more of a breeze for them. They won 4-1. Goal scorers were Alex and Aston. It was a great effort from the entire team with good strikers and defense and passes that paid off. Alex was Player of the Day. Trainings are run at lunchtimes on Friday's for Years 3 & 4. What a night! The team were fabulous last night. They are so motivated and eager! We lost the first game to the Orewa Chargers 4-0 but won the second game to Orewa North 2-1 with Luca and Ethan scoring goals. Luca was Player of the Day for his awesome attack, great field play and scoring the winning goal. Well done to everyone. We also had the opportunity to have a picnic dinner with some of the other primary soccer families at the park. It was good to catch up and let the kids have some play time. 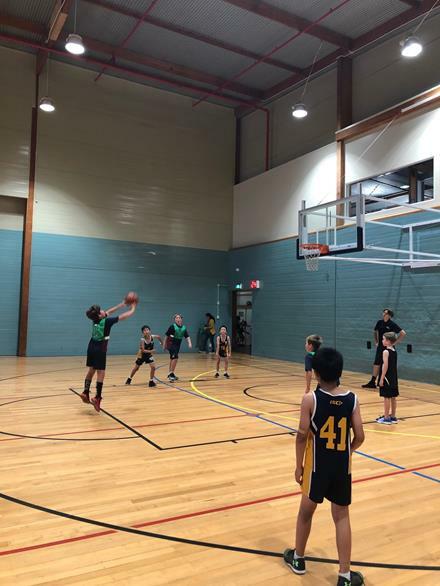 Our first game this week was a friendly against the Wentworth Wasps Years 7/8 team. We had a lot of fun playing with our older Wentworth family. The competition game this week was tough and unfortunately we didn’t play as well as we could, Maybe it was the hot weather. It will be a new week this week so we will continue to try our best with only 2 competition games left for the season. This week's Player of the Day was Rory Brabant. 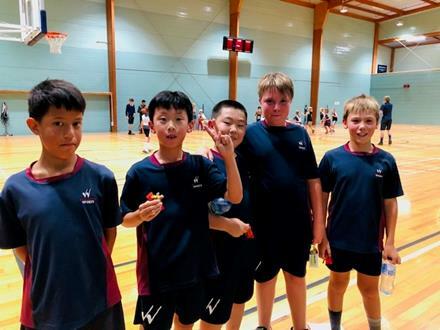 The Wentworth Rockets played against Whangaparaoa. We won 31 - 8. Alexander got Player of the Day for great passing. Well done on an excellent game, Rockets! In the first game against Stella Maris, our little team lost 7-0 against an older, bigger and experienced team (mostly Year 2's and even a Year 3 player). We played a really exciting game against Red Beach, and although we lost again, 5-0, there were 3 really good attempts at goals by our team and some good defending with excellent saves by Cyrus Luo. Player of the Day went to Maddie Vaudrey,who played such a high energy game, was always on top of the ball, called out for the ball to be passed to her, and would go in for a tackle without hesitation. Although the score was 0-3 to Silverdale Galaxy it must be noted that with only one sub at our disposal, the team had to play a lot harder than their opponents. Their consistent effort and concentration is to be commended. The Warriors refuelled with a second match tea of oranges, thanks to Elsa's father, during half-time against Silverdale Galaxy. This spurred on Jacob and Theo who, for the entire two matches, did not have a single minute off! The last two goals were quite lucky ones and the Warriors demonstrated great stamina and determination to try and score right up until the very last minute. Terrific effort and play by all. Ezrah took home the Player of the Day award for his consistent effort and good sportsmanship. 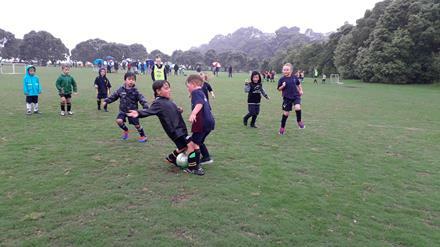 The Dragon's soared, roared and pulled the teeth of Stanmore Bay Tigers with a 7-2 victory. An impressive, disciplined team win saw them fall into a rhythm that became their undoing in their second game against a faster-paced Orewa Daredevils- succumbing 4-0 but winning some important experience that saw them regaining composure and zero goals conceded in the second half. Great teamwork! Player of the Day was Olliver Lee for his relentless attempts at scoring. Another awesome week of soccer. The team are finding their positions and are doing really well. Lots of laughter and fun. Goals were scored by Oscar, Harper and Bella. Player of the Day was Oscar for covering the field, awesome tackling and sticking to the ball. We lost 1 - 4 to Silverdale and 2 - 3 to Gulf Harbour. Team!! what can we say…… you all played so well. The whole team played with drive, attacking the ball on defence and conceding no goals in either games. We started to pass to our team mates which we hope continues. Player of the Day went to Ben Oliver. We took two wins this week which was well deserved. We played against Red Beach Primary School and we won, 10-5. We played really well! I got Player of the Day for great passing and ball skills. What an exciting afternoon for our Year 1 team. They are all starting to play really well as a team and we are seeing some real stars emerging. In the first game against Gulf Harbour Primary school “GHS Phoenix” Daniel Campbell quickly scored the first goal, so we finished the first half in the lead. During the second half Daniel scored a beautiful goal again, but straight into the opponent’s net, so that what should have been a 2-0 win, became a 1-1 draw. (It can be hard to remember that teams change goals at half time.) But that didn’t detract from the amazing skills demonstrated by Daniel and his team mates. The second game against Stanmore Bay Kickers we lost 2-0, but we defended well and prevented a bigger loss, with some really good saves by Ophelia Cooke and others. Leo Zhang was awarded Player of the Day for a high energy performance, and for really knowing where he needed to be on the pitch, racing to protect the goal if the play was heading to the opponent’s end. The Warriors played the first half with only 4 players and did a great job at keeping the score line down. With a full squad the team started the second half with good attacking play and were rewarded with 2 great goals from Jacob and Timofei. The training sessions at lunch time are starting to show in the Warriors play. Well done to the whole team. The Warriors struggled at first to stay on their feet against a very physical GHS side. After a team talk at half time the side stepped up and played with spirit and sportsmanship. I was very proud of their improved passing and strong attacks on goal. The team battled to the final whistle and are starting to use the space on the pitch to build passes together. Timofei – for determined defence and endless running. The team are now galvanised and becoming greater than the sum of their parts. Improving their skills is compounding their tactical understanding and although they drew 1-1 against Kingsway and lost 2-1 to Silverdale, both of these games were against very strong, well-drilled teams. Player of the Day was shared by Daniel Vaudrey and Olivia for outstanding defensive play. Another fantastic effort by the Magpies. Unfortunately we lost 3-1 to Stella Maris and lost 3-1 to Whangaparaoa Balls. Sophie Imparato was awarded Player of the Day for her determination and strength as striker. Well done to the entire team! This week's game marked the half way mark of our summer soccer competition. After a very tough first game against a highly schooled team, the Strikers brushed themselves off and went on to take their first win of the season against a team we narrowly lost to last time. We look forward to the next round of competition to see how many other games we can have such positives results from. Player of the Day was Elijah Kirkpatrick. It was a great game this week, thanks to Bella and Aston for filling in for us. The players all tried really hard on defence. Daniel was Player of the Day with his awesome attacking skills. No report from last week's games. Our Year 1 team is continuing to find it tough against some much more experienced teams, but it isn’t deterring their enthusiasm. The first game was exciting against Dairy Flat’s “The Tail Feathers” team. Lewis West scored Wentworth Storm’s very first goal of the whole season, and we had two really good attempts at a further goal where the ball just missed by centimetres. The final score was 3-1 to The Tail Feathers, but the team were proving that they were learning to work together to get results. The second game was against a much more experienced team, Stella Hotspur. Even the 10-0 loss didn’t daunt Wentworth Storm players who carried on with determination, right through to the end. Player of the Day went to Lewis West for scoring the first ever goal for the team, as well as brilliantly saving a goal from the other team. He enthusiastically played for the entire two matches, hardly taking a break off the pitch. The Warriors worked hard on chasing the ball but were up against an experienced Lions team who scored 3 quick goals in the first half. Jacob scored a great goal in the 2nd half to get the Warriors on the scoreboard. Strong defending saw some good saves from Timofei and Theo. The Lions won the game with a goal that trickled over the goal line as our defence got tangled. After a great energy boost of oranges and crackers (thank you Theo’s Mum) the Warriors played a good attacking game to score 2 goals. Ezrah worked hard to get the ball to his team with some good free kicks and Charles, Jacob and Theo put some good shots on target. The girls are showing improvement in their tackles and good running to get back and help in defence. The score line was close and the sideline support was loud as the Warriors played well to lose by a narrow margin. Player of the Day went to Jacob Owen for his timely tackles and strong shots on goal. The practise showed good results this week as the Dragons played much better as a team, passing to each other and looking for space. Player of the Day was Aston Carter for finding space and taking opportunities to score goals. Trainings are run at lunchtimes on Tuesdays for Years 3 & 4. Another fantastic week of soccer for the Magpies! They are such an eager and keen team, displaying awesome sportsmanship and huge smiles. Unfortunately we lost both games, 5-1 to Dairy Flat and 5-1 to Red Beach. Player of the Day was awarded to Harper Crummer who displayed excellent boot skills, awesome defence and offence, and the ability to anticipate the opposition's moves and be there to meet them. Well done Magpies. It is great to see the Strikers improving each week; this week we had 2 really good games! We played extremely well in our second game although the score doesn’t reflect how well we did. After a quick 10 minutes of goals by the opposition we regained our positions, played really hard and kept the opposition scoreless in the 2nd half. The whole team can be proud of their efforts. Player of the Day this week was Annabelle Duncan. The Years 3 & 4 Basketball team won by default last week due the opposing team having injured and sick players. The Wentworth Rockets won 24-0. Elijah was awarded Player of the Day for being all around the court and for excellent shooting and scoring! Well done Rockets!